Earlier this week, Freund-Vector, presented two posters at AAPS in Washington, DC. These posters focused on Freund-vector’s twin screw design in a continuous granulation system. Using this twin screw design, robust and high drug load APAP granules were produced. 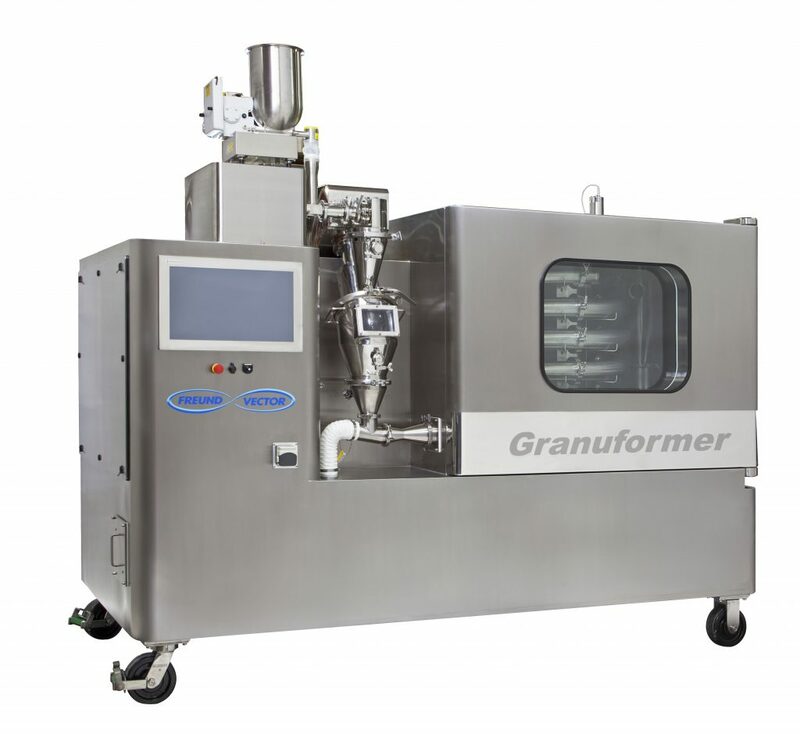 Freund-Vector’s Granuformer® (Gf-215) is an innovative new system that can perform granulation and drying continuously. It begins with blending the raw materials, which feds a twin screw extruder and vertical granulator and ends with a spiral dryer. To learn more about Freund-Vector’s Granuformer® (Gf-215), check out Freund-Vector’s YouTube Channel. Challenges exist in developing a robust continuous twin screw granulation process. One of the past challenges encountered has been the formation of “noodle-like” granules at the end of the extruder1. “Noodle-like” granules have unacceptable characteristics for post processing such as tableting. The objective of this study was to evaluate the performance of different barrel and screw designs of a novel continuous granulation system on the granule properties of a hydroxy-propyl methylcellulose (HMPC) based formulation. Since most pharmaceutical ingredients (API) have low density and poor flowability, wet granulation is practiced extensively for ease of handling. Wet granulation can be achieved by means of high shear mixers, fluid beds and twin-screw granulators. The former two methods are commonly used batch processes with long processing times. In addition, scale-up trials can be expensive, time consuming, and complicated. Twin-screw granulation offers the advantages of being easily adaptable into a continuous manufacturing system and elimination of scale up studies. 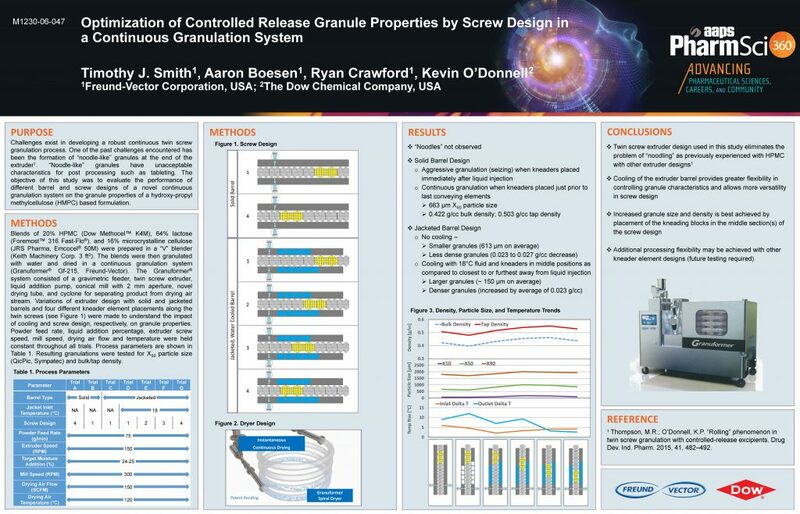 This study explored the advantages of continuous granulation by twin screw technology on Freund-Vector’s Granuformer® (Gf-215) to make high load acetaminophen (APAP) granules and studied the effect of polymer choice and process parameters on making robust granules and tablets. Continuous granulation is capable of making stronger, yet fast-dissolving tablets. All polymers yielded robust formulations and there was minimum effect of process variables on tablet hardness. Gf-215 provides high mixing intensity, improved tablet strength and robustness. These posters can be downloaded by visiting Freund-Vector’s Showcase on Slideshare. If you are interested in learning more about how Freund-Vector’s Granuformer® (Gf-215) can assist with your continuous granulation and drying needs, please send email to sales@freund-vector.com . This entry was tagged Granuformer: Continuous Granulator. Bookmark the permalink.